Ashkelon is a C.V. like a history book. It has been ruled by the Ancient Egyptians, the Canaanites, the Philistines, the Assyrians, the Babylonians, the Greeks, the Phoenicians, the Hasmoneans, the Romans, the Persians, the Arabs and the Crusaders, until it was destroyed by the Mamluks in 1270. I suggest you begin your tour at the Canaanite Fortifications of Ashkelon. Ashkelon was the oldest and largest seaport in Canaan, one of the Philistine “five cities” (“pentapolis”). Ancient Ashkelon was built on a sandstone outcropping near the Mediterranean. The city was close to a stable underground water supply and a major international roadway. Historians claim that it was very large in comparison to other ancients cities with a population of 15,000 people living inside the walls. But then, historians can exagerate. Ashkelon was a thriving Middle Bronze Age (2000–1550 BC) city of more than 150 acres. “Also Judah took Gaza with the border thereof, and Ashkelon with the border thereof, and Ekron with the border thereof.” the city actually remained in the hands of the Philistines. 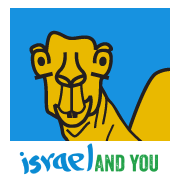 Ashkelon derives from the western Semitic root sh-k-l which means to weigh – perhaps due to its mercantile activities. Egyptian “Execration texts” of the 19th century B.C.E. first mention Ashkelon. Execration texts are ancient Egyptian hieratic (abridged hieroglyphic) texts, listing enemies of the Pharaoh. Ashkelon also appears in hieroglyphics as “Askala” and in the Tel al Amarna letters. The Greek writer Theophrastus must have used linguistic humor when he claimed that the words scallion and shallot are related and can be traced back to the Greek ασκολόνιον (‘askolonion’) which originated from the name of the ancient Canaanite city of Ashkelon. 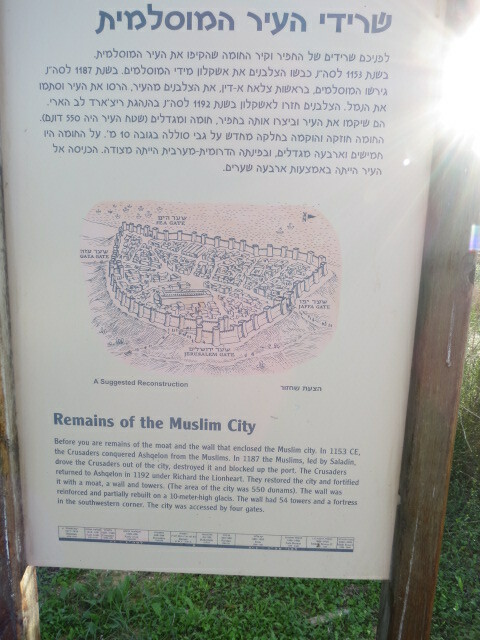 Archaelogy began in Ashkelon with Lady Hester Stanhope’s expedition in 1815, She pursuaded the Ottoman authorities to allow her to excavate the site in search of a large hoard of gold coins allegedly buried under the ruins of the Ashkelon mosque. The famous governor of Jaffa, Abu Nabbut, accompanied her to care for the Ottoman “interests”. Stanhope’s main find was a seven-foot headless marble statue, which was smashed and thrown into the sea. Ramparts: The Canaanite Fortifications of Ashkelon have ramparts that are 2.4 km long, 15 m high and 46 m thick, standing two stories high. 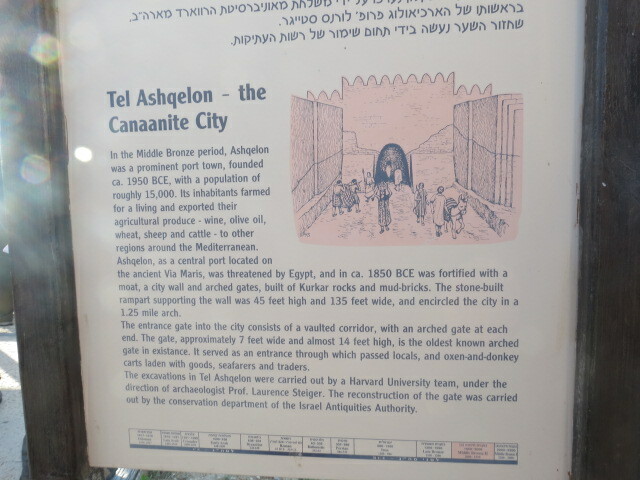 The Canaanite Gate: The Canaanites built the mudbrick city gate of the Canaanite Fortifications of Ashkelon in 1850 B.C.E. 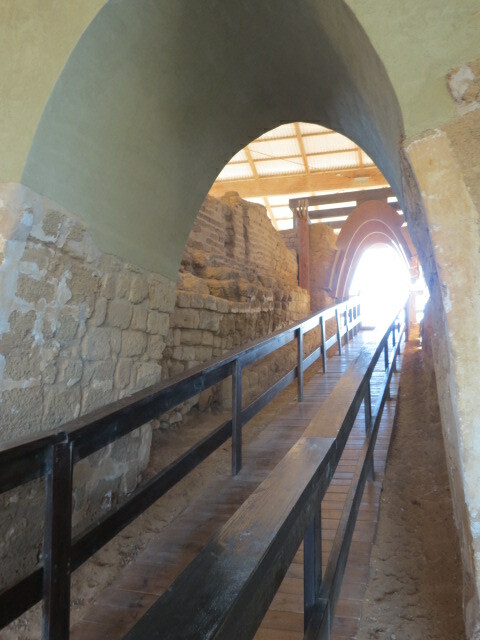 This gate had a stone-lined, 2.4 m wide tunnel-like barrel vault, coated with white plaster, to support the superstructure. The gate was 15 meters long and 4 meters high. It is the second most ancient archway in the world (after Tel Dan). Ashkelon local-patriots claim it is the oldest ancient archway in the world. Ramparts: Later Roman and Islamic fortifications, faced with stone, followed the same footprint, creating a vast semicircle protecting Ashkelon on the land side. On the sea it was defended by a high natural bluff. 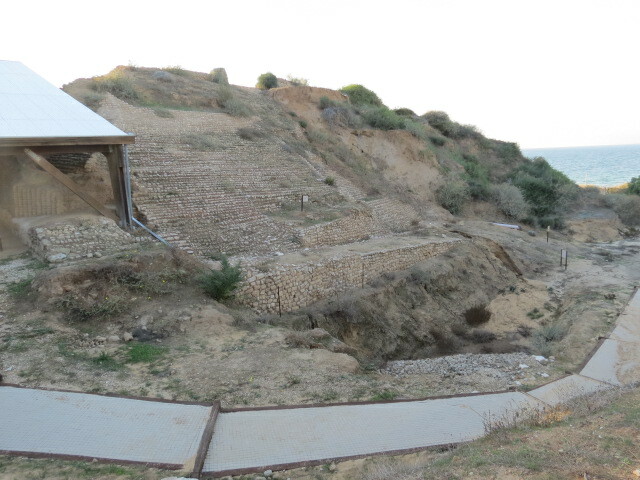 Harbor Road: A roadway more than 6.1 m in width ascended the rampart from the harbor and entered a gate at the top. In 1991 archaeologists found a finely cast bronze statuette of a bull calf, originally silvered, 10 cm long in the ruins of a small ceramic tabernacle. Images of calves and bulls were associated with the worship of the Canaanite gods El and Baal. The Ottoman Empire established the Arab village of al-Majdal or al-Majdal Asqalan (المجدل‎‎), in the late 15th century by the Ottoman Empire a few kilometres inland from the ancient site of Ashkelon. The village was taken by Israeli forces on 5 November 1948, by which time most of the Arab population had fled. Jewish “olim” new immigrants were settled in the village which was called Migdal Gaza, Migdal Gad and Migdal Ashkelon. By 1950 no Arab population remained in the village. In the meantime 1953, the nearby neighborhood of Afridar was incorporated under the name “Ashkelon” . The ancient site of Ashkelon is now Ashkelon National Park on the city’s southern coast.This a unique park which offers antiquities, a declared bathing beach, an overnight campground, picnic tables, barbecue facilities, as well as a modern 10,000 seat amphitheater for cultural events. 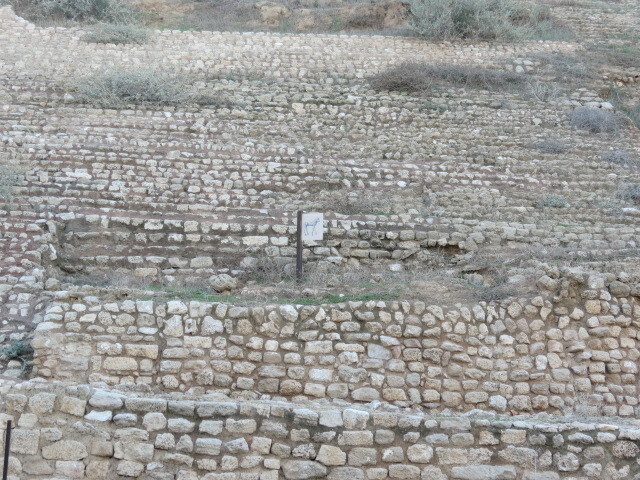 The Fatimid city walls that encircled the city are still visible. 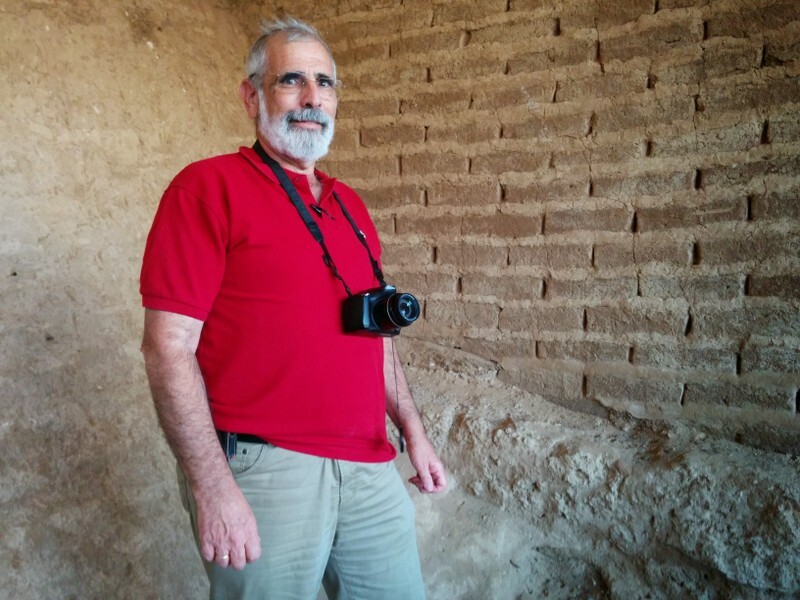 You can climb the Canaanite earth ramparts and enter the Canaanite gate. Don’t forget the Roman basilica. Surprise! Excavations have revealed the largest dog cemetery in the ancient world. Telephone: 08-6739660, 08-6736444. Dogs are permitted only on a leash and with a muzzle. Animals may not be brought into the overnight campground, other than seeing-eye dogs.